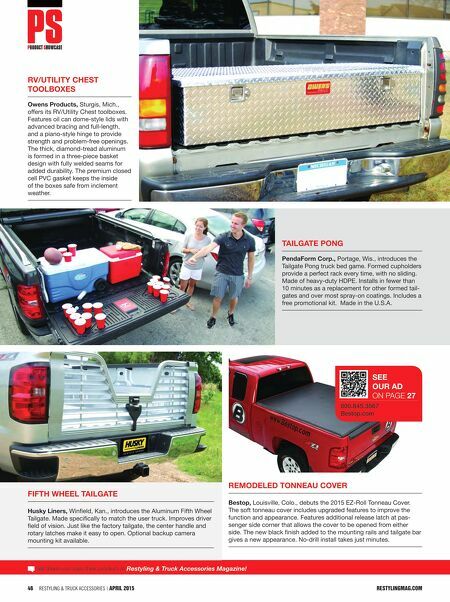 46 Restyling & tRuck AccessoRies | April 2015 restylingmAg.com Tell them you saw their product in Restyling & Truck Accessories Magazine! Remodeled Tonneau CoveR Bestop, Louisville, Colo., debuts the 2015 EZ-Roll Tonneau Cover. The soft tonneau cover includes upgraded features to improve the function and appearance. Features additional release latch at pas- senger side corner that allows the cover to be opened from either side. The new black finish added to the mounting rails and tailgate bar gives a new appearance. No-drill install takes just minutes. Rv/uTiliTy ChesT ToolBoxes owens Products, Sturgis, Mich., offers its RV/Utility Chest toolboxes. Features oil can dome-style lids with advanced bracing and full-length, and a piano-style hinge to provide strength and problem-free openings. The thick, diamond-tread aluminum is formed in a three-piece basket design with fully welded seams for added durability. The premium closed cell PVC gasket keeps the inside of the boxes safe from inclement weather. TailgaTe Pong PendaForm Corp., Portage, Wis., introduces the Tailgate Pong truck bed game. Formed cupholders provide a perfect rack every time, with no sliding. Made of heavy-duty HDPE. Installs in fewer than 10 minutes as a replacement for other formed tail- gates and over most spray-on coatings. Includes a free promotional kit. 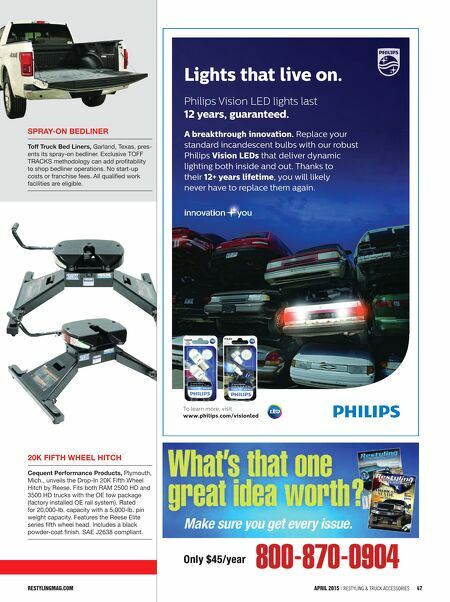 Made in the U.S.A. 800.845.3567 Bestop.com see ouR ad On page 27 FiFTh Wheel TailgaTe husky liners, Winfield, Kan., introduces the Aluminum Fifth Wheel Tailgate. Made specifically to match the user truck. Improves driver field of vision. Just like the factory tailgate, the center handle and rotary latches make it easy to open. Optional backup camera mounting kit available.